i thought about going to the mooneyes show today. really i did. but decided to skip it. i'm seriously going to run out space on my hard drive, and i intend to go to two shows tomorrow. already was invited to go to one of them tomorrow, so i'll make a day of it. that will probably be it until after the holidays. missed the thanksgiving sales on drives, so hoping they go back down after xmas. i'm going to have to go through some of my older pictures and "edit" out the ones that are just not worth the time or space, that i'll never do anything with anyway. meanwhile, i'm just going through some of favs. 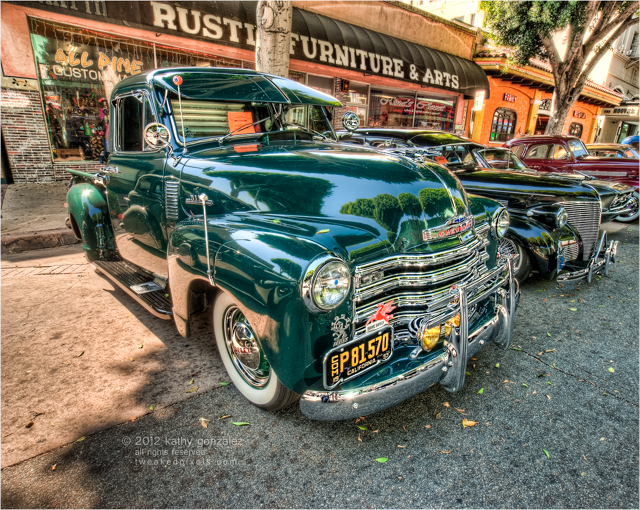 like this truck; liked the reflections on the hood. not too many people around, this far down the main street. always wonder who buys the crap they sell in that rustic furniture store, but the paint colors of the buildings do go well with the green of the truck.